Algebra is best defined as a generalized and abstracted basic mathematics. In basic math emphasis is on simple operations applied to numbers or discrete values to provide a result. This is true for simple algebra. Elementary algebra steps beyond discrete numbers and constant terms to include variables, symbols that can represent a numeric value or quantity. Variables are literal numbers (or literal factors): a, b, c, x, y or z. Symbols specifying a constant value can be represented by Greek, Latin or other symbol. The Greek letter π (pi) is a mathematical constant for the ratio of a circle's circumference to its diameter, approximately 3.1416. Literals, capitalized or lower-case are different symbols. “A” is not “a”, “B” is not “b”. Lower-case is often used for a literal factor. Algebra has operations not considered basic math. The Greek letter ∑ (sigma) designates summation of a set having a range of values. By combining constant and variable symbols, what is numbers in basic math expands to the concept of a term. In algebra, all mathematical operations are applied on terms. A number is a coefficient of a term. A simple term could be a number, a literal number, or a number and a literal number: 4x3, meaning “x” cubed is multiplied by the coefficient four. 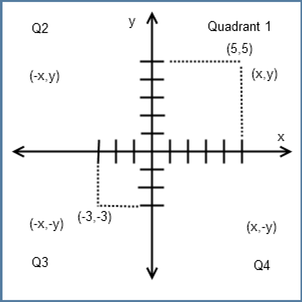 Cartesian Coordinates for Elementary and Advanced Study. Terms combined with math operations form expressions. An algebraic expression with two or more terms is a multinomial. A simple expression is: 4x2 + 2x + 6; an expression with 3 terms. When a value for “x” is provided the terms can be evaluated for value and written as an equation 4x2 + 2x + 6 = y. The equation by using an expression provides a solution for y, the value of y. We could just as easily write 4x2 + 2x + 6 as 2 (2x2 + x + 3), each the mathematical expression of the other as equivalent different form, identity. Then, 4x2 + 2x + 6 = 2 (2x2 + x + 3) = y. Much of math from algebra onward is working with equations, expressions and forms of expressions. Math equations and expressions can define very abstract algebra relationships. Suppose the mass of matter and energy. If we could prove mathematically that mass is equivalent to energy then that aspect of mass and energy becomes an expressed relationship, an expression of the other; the same with different identity. This is what Albert Einstein demonstrated with E = MC2. It means the energy contained in matter (E) is equal to the mass of the matter (M) times the speed of light (C) squared. This equation helped prove the mass of matter and energy are not separate, but different forms of the same thing. I can’t think of a better way to say it; an expression is a different form of the same! Algebra is often taught as a math by itself to learn rules, properties and permutations of operations on terms using symbols. Its legacy is a math of trigonometry and geometry as a language enabling the description of many physical shapes and forms in their absence, and therefore provides abstract representation of physical shapes or forms. The algebraic equation is an expression of identity, an abstract representation by symbols, letters and operations that do not look anything like the physical shape or form. The specific shape or form can be created or constructed from the abstract representation. 4x2 + 2x + 6 = y. In pre-calculus or elementary functions we write f(x) = 4x2 + 2x + 6; f(x), is a function of x, then f(x) = y. They are similar with differences attributed to subject emphasis on particular math topics by author(s) of the text. f(x) often represents a two dimensional or three dimensional map relationship as Cartesian coordinates (x, y) or (x, y, z) where the equation defining f(x) specifies a set or range of values, the domain of the function as line, area or other function type. Substitution Property – The equation formed by substituting one expression for an equal expression in an equation is equivalent to the original equation. Addition Property – The equation formed by adding (or subtracting) the same quantity to both sides of an equation is equivalent to the original equation. Multiplication Property – The equation formed by multiplying (or dividing) the same quantity to both sides of an equation is equivalent to the original equation. Think of algebra as advanced basic math; that the purpose of basic math is the necessary foundation of algebra. Basic math often incorporates pre-algebra concepts, though that algebra is restricted to simple formulas relating trigonometric shapes, geometric shapes and lines. There usually isn’t an absolute delineation that separates one topic from another in mathematics. It’s fuzzy, it integrates. What is absolute is that algebra establishes the foundation for all other branches of mathematics beyond basic math.